Wednesday April 27th 1881 I went over and helped Win till noon when we finished up. I went down to Hatts and stayed till after dinner. I then came up town and got me a new gingham dress and some other things. I ripped up my old black alapaca skirt in the afternoon and after supper baked three nice cakes. 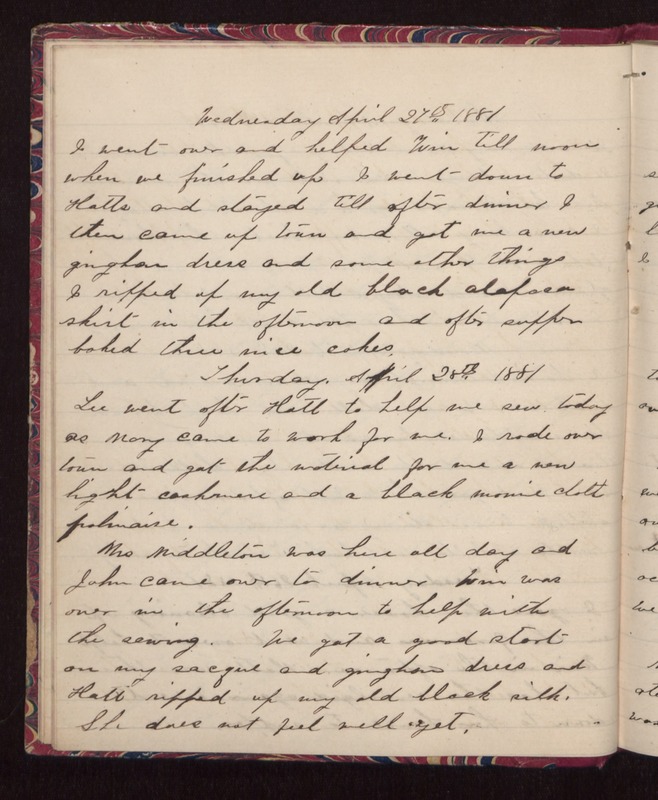 Thursday April 28th 1881 Lee went after Hatt to help me sew today as Mary came to work for me. I rode over town and got the material for me a new light cashmere and a black monie cloth polinaise. Mrs Middleton was here all day and John came over to dinner Win was over in the afternoon to help with the sewing. We got a good start on my sacque and gingham dress and Hatt ripped up my old black silk. She does not feel well yet.